Because of my recent experiences with mourning, I’ve come up with a list of things people should do and shouldn’t do when trying to comfort grieving families. Some of the list would apply mainly to a tragic death and others could apply to any close death. Share memories of deceased person or how they impacted you. Phone before visiting & bringing food over – they may have enough people visiting for that day and need some space and their freezers and fridges may be full. If bringing food, ask about allergies – I heard of someone who was a celiac and people kept bringing food with gluten so she couldn’t eat most of the food brought to her. Think about bringing juice or something to drink. Put your name on food you bring and any heating instructions if possible. Contact them, even if only an email or text. Offer an idea of how you can help instead of saying ask if you need anything, if possible. Be aware they might tell you they’re fine when they aren’t depending on how close you are to them. Be aware that not everyone wants to talk about it and may need more space than others. DO NOT introduce them to your girlfriend the day after the death. DO NOT visit if you’re not close to at least one member of the family or to the deceased person. DO NOT ask if people came over to visit them specifically – it may cause them feel alone if someone hasn’t come over to visit them specifically. DO NOT forget about the family after the funeral – it does not get easier after the funeral. DO NOT tell them what to do for the funeral unless they ask. DO NOT try too hard to make them smile – they experienced a death and smiling won’t come easily. DO NOT say on the bright side, now you only have …. – ex. Now you only have 3 brothers to bug you. DO NOT push them to open up if they don’t want to – if they don’t want to talk, they don’t want to talk. DO NOT tell them you’re pregnant, or something similar and expect them to be happy for you. DO NOT post stuff online that you wouldn’t want the media to get a hold of. The day Danielle Harding takes her 11-year-old son, Simon, and flees from her abusive husband, is the same day Kurt Harding dies. A relieved Dani believes she and her son are finally safe–but in reality, the danger has just begun. When Kurt was alive, he took something important to a mysterious person. That person wants the item back and believes Dani now has it. As she and her son run for their lives, they have nowhere to turn, until she hires Adam Buchanan of Operation Refuge and goes into hiding. Unfortunately, she won’t be able to hide for long . . . I really enjoy Lynette Eason’s books and this one was no different. This is the second book in the Hidden Identity series where we get to learn more about Adam Buchannan who we were introduced to in the first book. This book had a lot of suspense in it which I liked. It also kept me guessing as far as who was all involved. It is fast paced and kept me on the edge of my seat. The characters barely got a chance to breathe with all the action and the slower paced sections gave depth to the characters. As a plot driven reader, I enjoyed that the action was the focus and the romance was more of an afterthought. The romance was there but it wasn’t the focus. I would have liked to have seen Dani struggle more with her trust of men after her experiences but then it might have become the focus and I liked it the way Lynette Eason did it. For two years, Allen and Michele have been trying to have a baby. For Michele, it has become an obsession. But Allen seems content to spend his time–and their money–saving orphans in Africa. As Michele researches their options for fertility treatments, she begins to resent Allen’s divided attention. And yet, God has a plan for Allen and Michele that they could never have imagined. All it takes to set it in motion is a change of heart . . . I enjoyed the overall story, although I did find it a little difficult to get into because it didn’t have as much description as I’m used to in other books I read. I also had a hard time picturing the characters because there wasn’t much description on what they looked like. I was expecting the book to have more romance in it because of it being about a couple who struggled with infertility but the only romance between the couple really was them holding hands and occasionally it said they kissed but that was it. 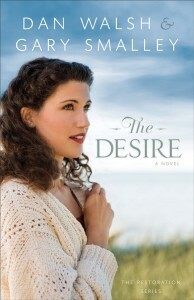 The Desire is a story that focuses a lot on trusting God in every circumstance.